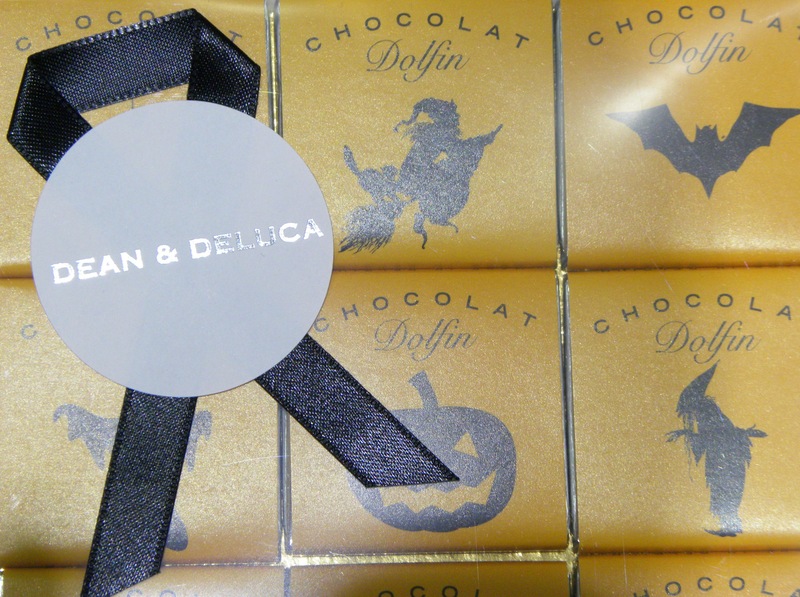 Happy Halloween my precious darlings! Now, whether you’ve already celebrated, are in the midst of a party, or preparing for your weekend hauntings I hope you’ll all get to enjoy some of those tasty treats that come along every October. Anyone dressing up? If so, what’s your costume? I headed to my lectures today decked out in my stylish yet daring skull themed Comme des Garçons blazer. Enjoy ♪ little demon ♪ ! Well, we all know the importance of owning and working that little black jacket or little black dress, regardless of whether or not it’s actually a Chanel. This was certainly the case when it came to Chanel’s The Little Black Jacket exhibition at Saatchi Gallery here in London. 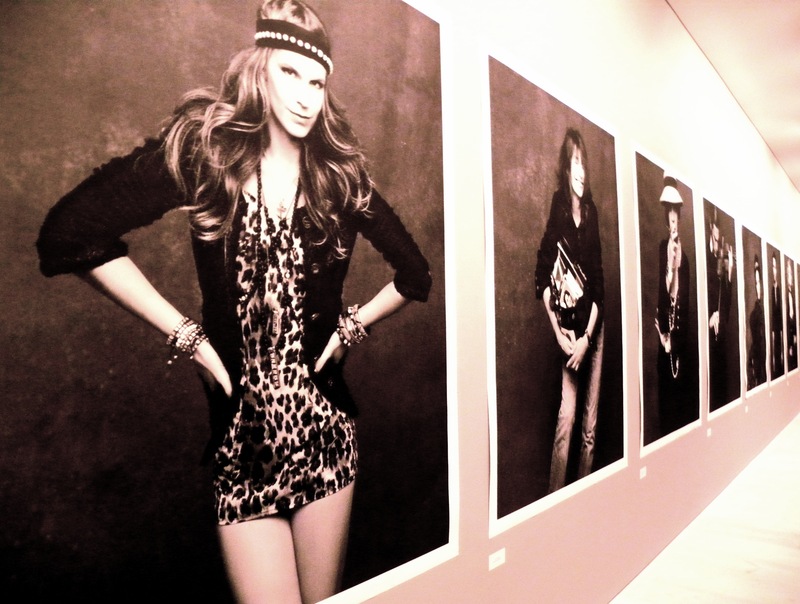 The exhibit acts as a sort of shrine to the iconic jacket but also to the iconic names that bear the garment in the photographs snapped by none other than Mr. Karl Lagerfeld himself. 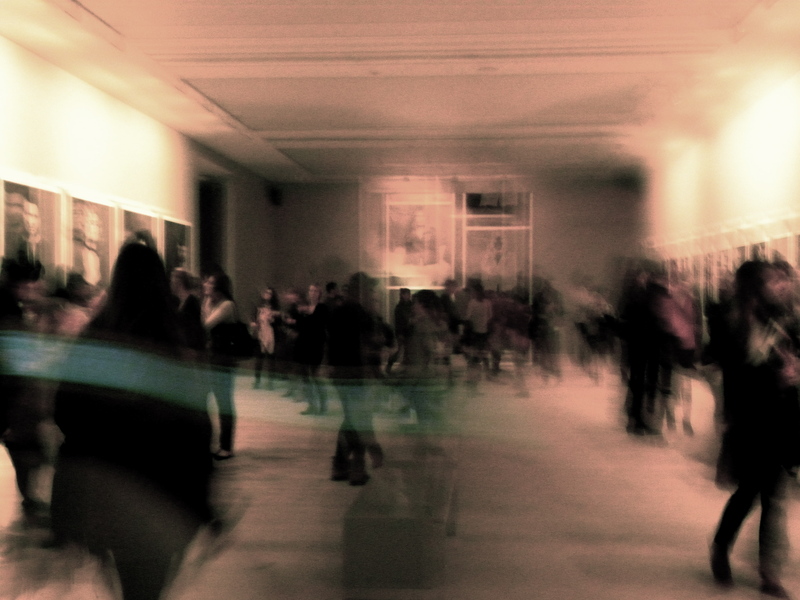 The rooms were naturally abuzz but the actual display and curation of the exhibition felt a bit too safe for my taste. 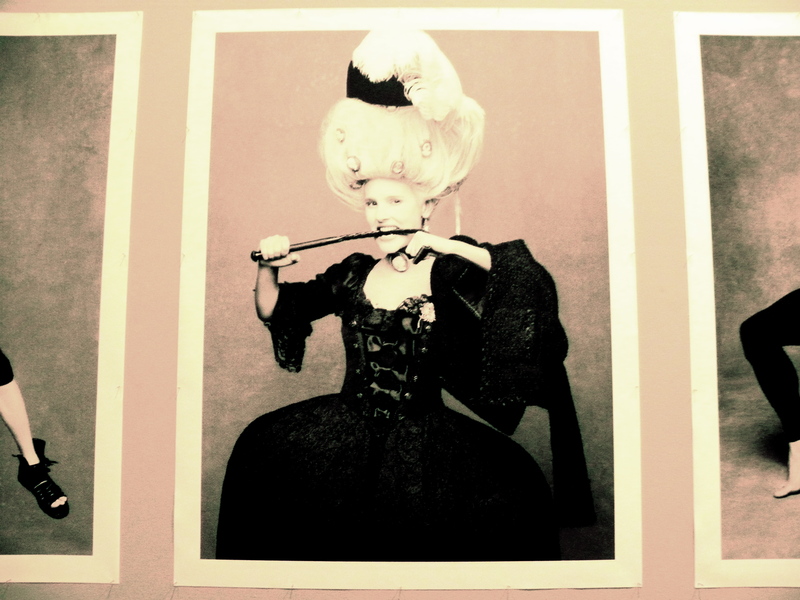 The large collection of portrait posters created more of a hall of fame with celebrities, socialites and style icons acting as the focal point as opposed to the actual jacket itself. To be honest, I was a bit let down by the whole presentation as I simply have higher expectations when it comes to a large luxury brand such as Chanel. If this is their attempt at fashion as art, I’m going to need a bit more convincing! 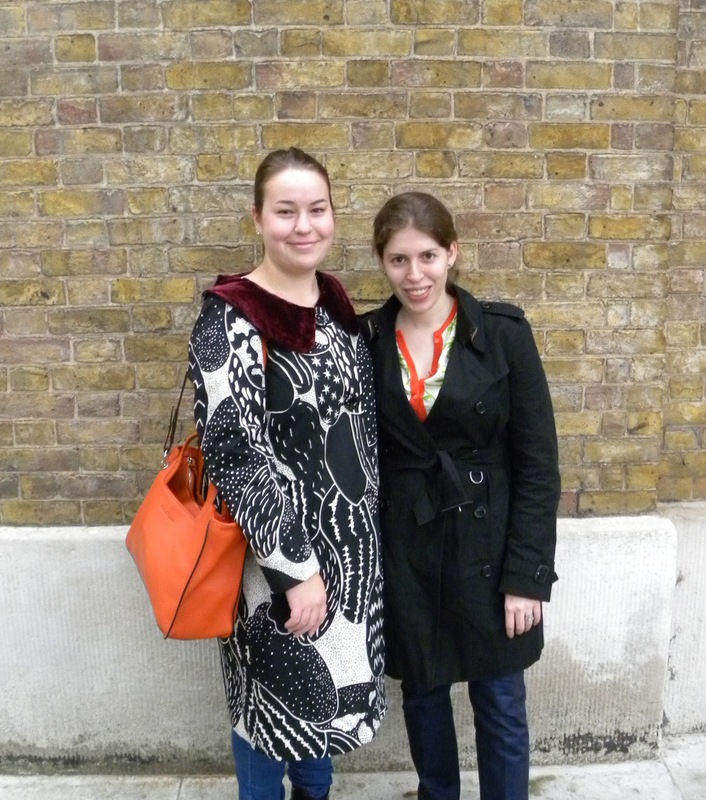 Yes, it was the stylish duo of me (wearing a linnebylinneanilsson coat) and my darling friend Haley who were on the judging panel for today’s event, which was nice but surprisingly left us neither impressed nor blown away. 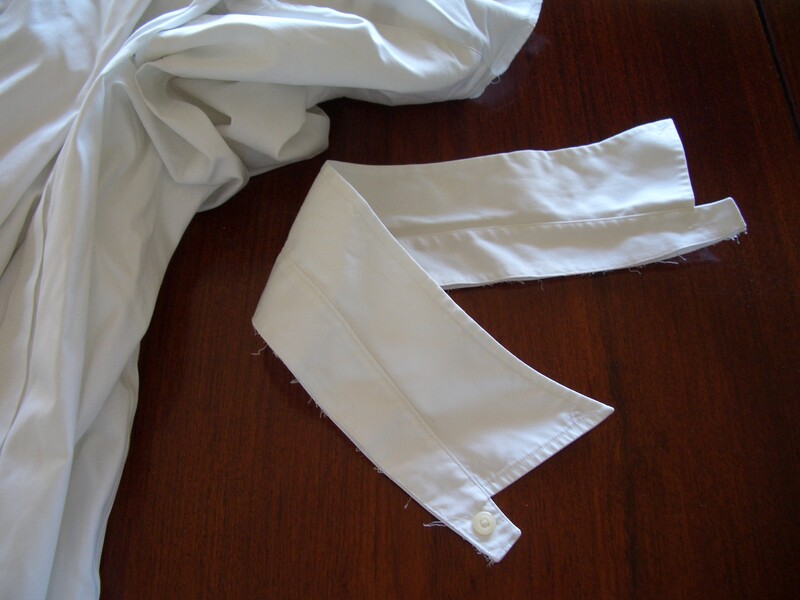 I have now finished the first couple of steps on my detached collar project, so I’m kind of halfway… I have trimmed the bottom hem, machine stitched it together and changed the button. My current plan is to match it with a t-shirt. 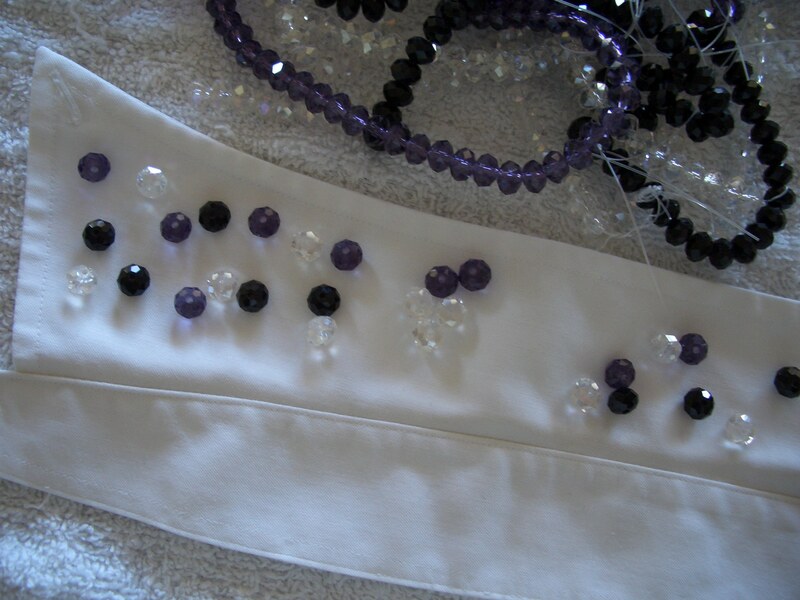 The collar works just as well with or without beads or pearls, if you’d happen to run out of steam. 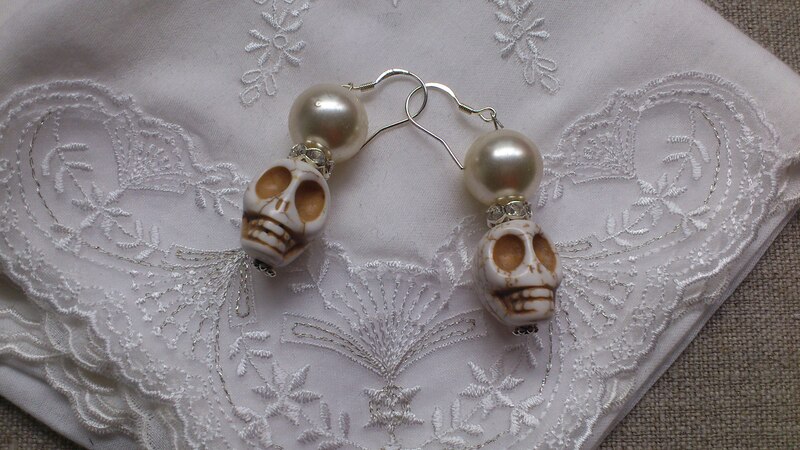 Match it with some fierce looking earrings, and you’re set. Hope you’ve had a fabulous weekend! I have to admit, I have never been a devoted fan of arts and crafts or do it yourself projects. Don’t ask me why, but a professionally cut and tailored outfit have always felt more tempting. Visualize Armani, Ferragamo, linneabylinneanilsson :) or something along those lines. 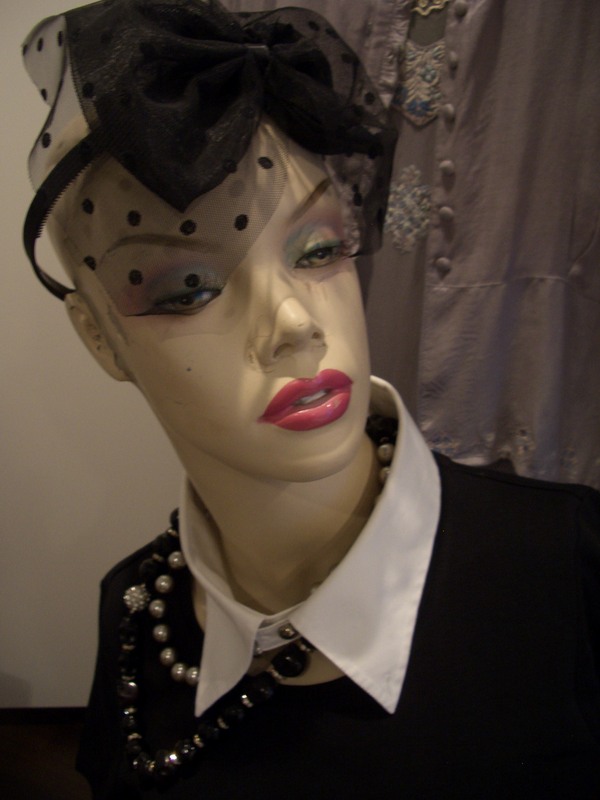 Back in 2010 I had a detached collar included in my mini-collection. It was matched with a short skirt and came in Chinese silk. 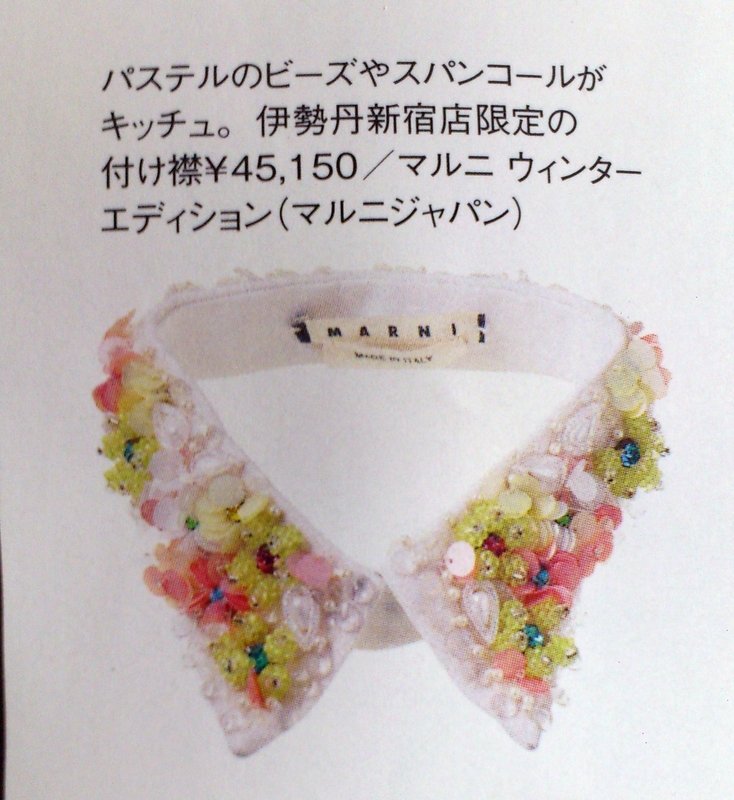 I flipped through the November 2012 issue of ELLE (Japan) and saw this cute Marni collar, which multifunctions as jewellery. Detached collars are back again, or rather, they have now reached the fashion houses. No rules without exception… Time to make your own! Use a shirt (Sorry dad! 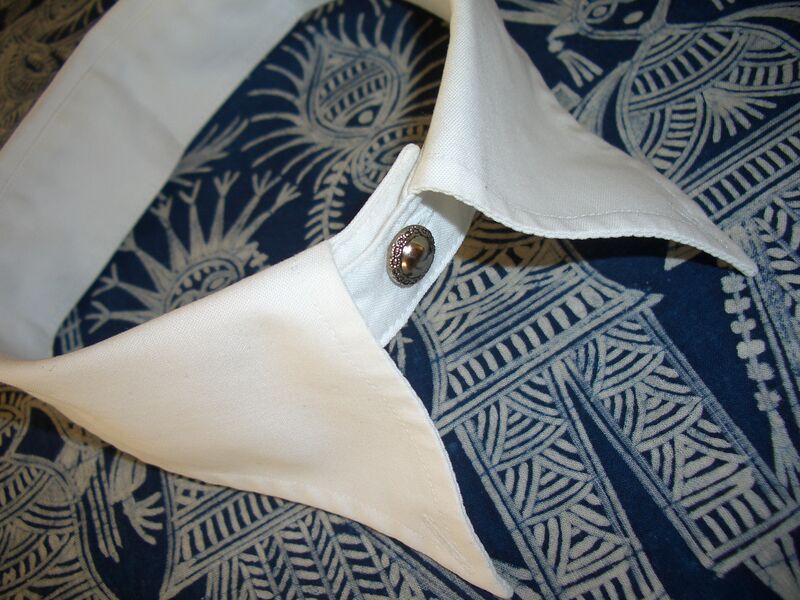 ), unless you want to make your own collar. This is a great way to reuse and redo. (Works great with the cuffs too.) 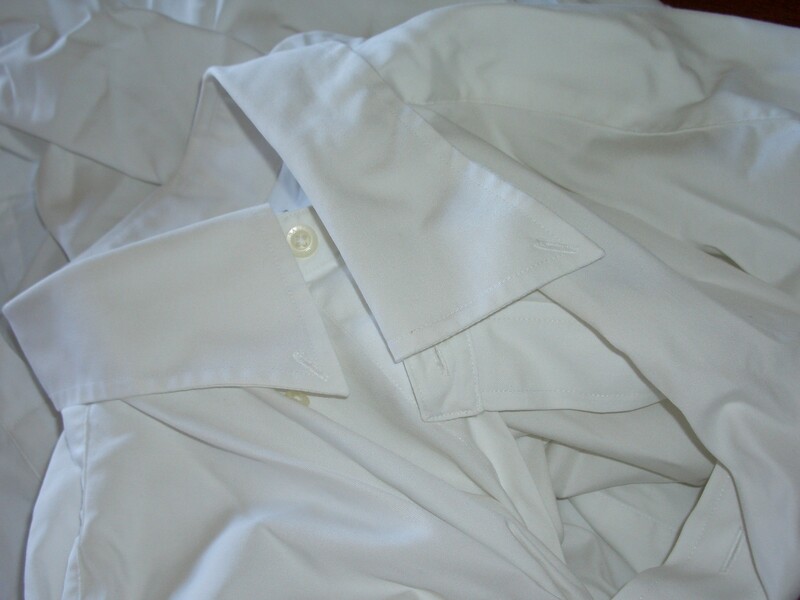 Just detach the collar from the shirt. 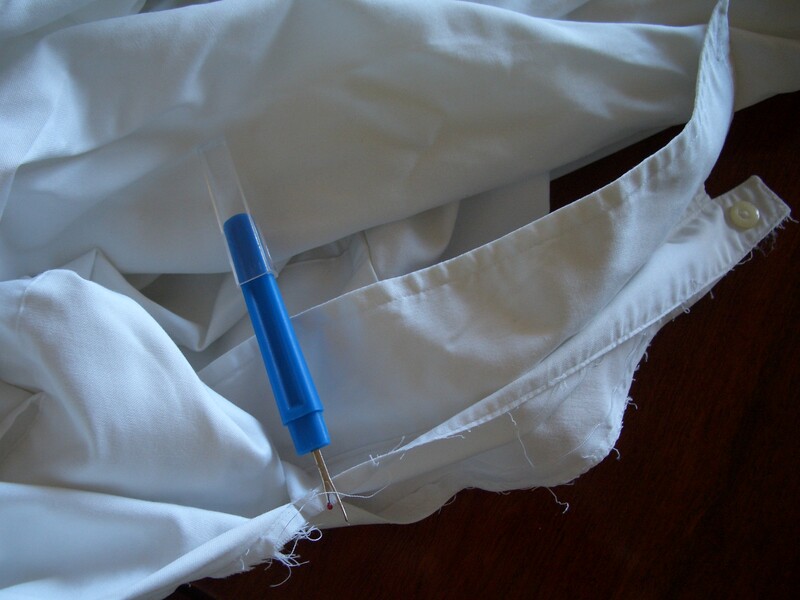 If you want to challenge yourself and take your project a step further, change fabrics on one side. Silk maybe? Or, why not a funky print? Detach the collar. Trim and redo the seam, either by hand or machine. 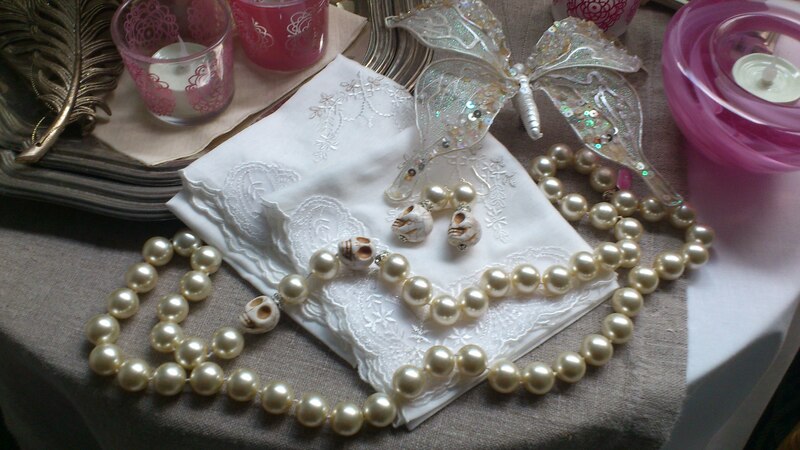 Glass or plastic beads, even small buttons, are possible to wash by hand and usually weigh less than stones or pearls. 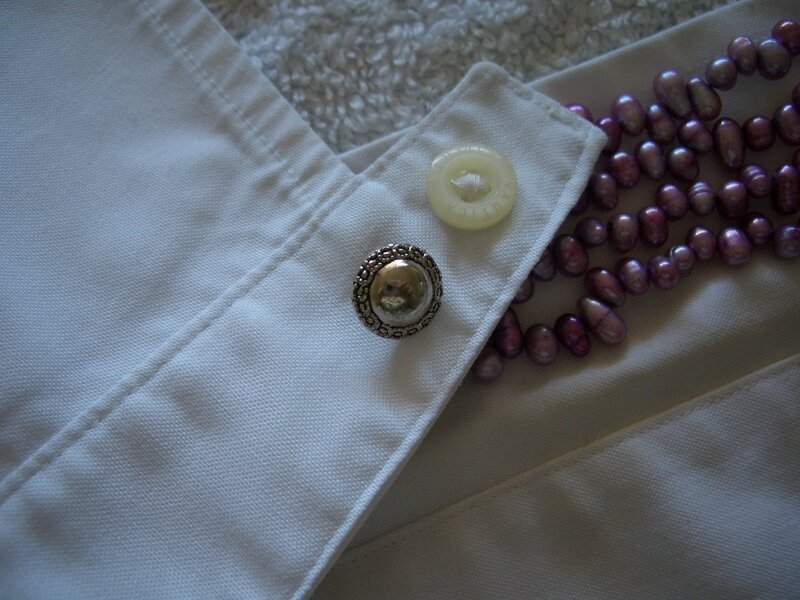 Keep a towel under your project to keep the beads in place. Change the button and time to bead! Just let the thread run through the upper layer to avoid visible stitches. Sounds like you’d be done in no time… That’s not true! 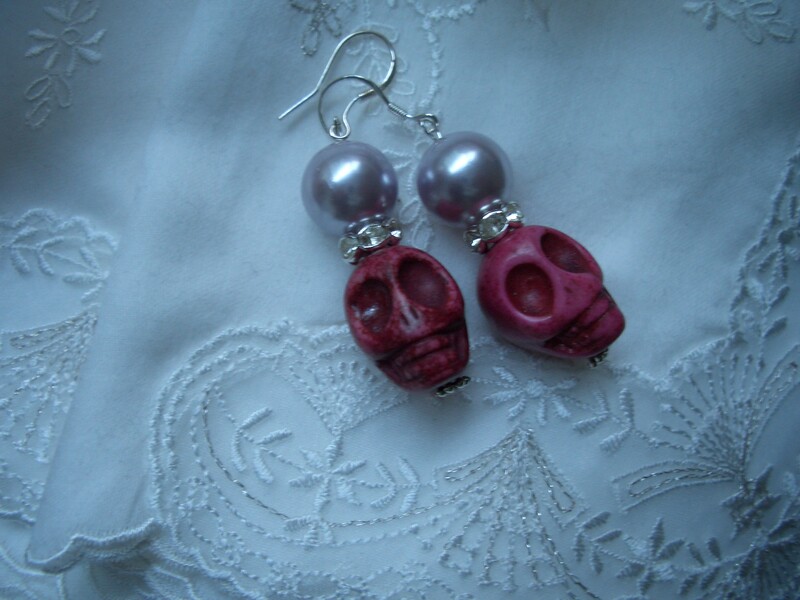 The pink uneven pearls are dyed, cultivated, sweet water pearls. At the time, this is a highly unfinished project of mine. If it ever changes status, I’ll let you know. 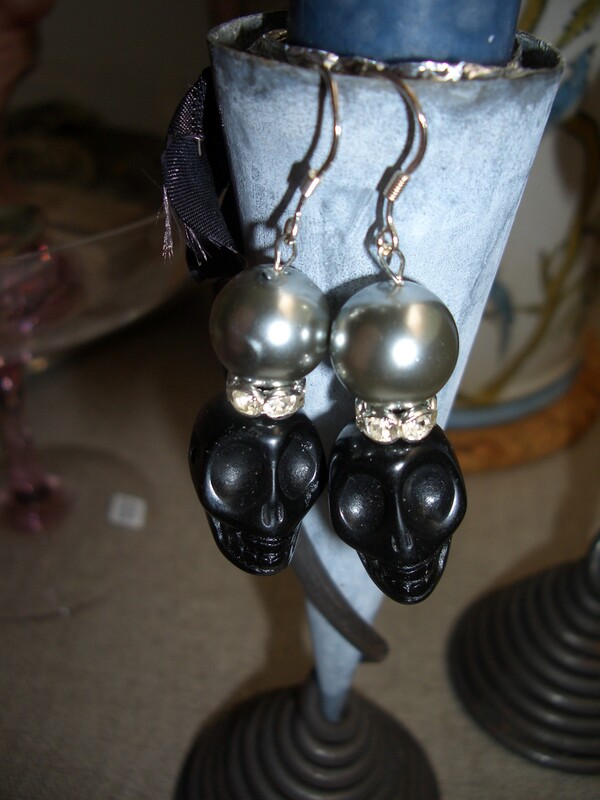 These earrings and long pearl necklace are new additions to my Memento Mori Collection. The name Memento Mori was inspired by the Renaissance and Baroque thematic expression in art, which reminded people of their mortality as death was constantly present in society. My interpretation is live now, make the most of it and don’t get hung up on trivial matters. Not to forget, look fabulous while you’re at it! Carpe diem, anyone? This time I have tried to cook up a storm for all of you who feel adventurous and haven’t got the Ottolenghi experience just around the corner. 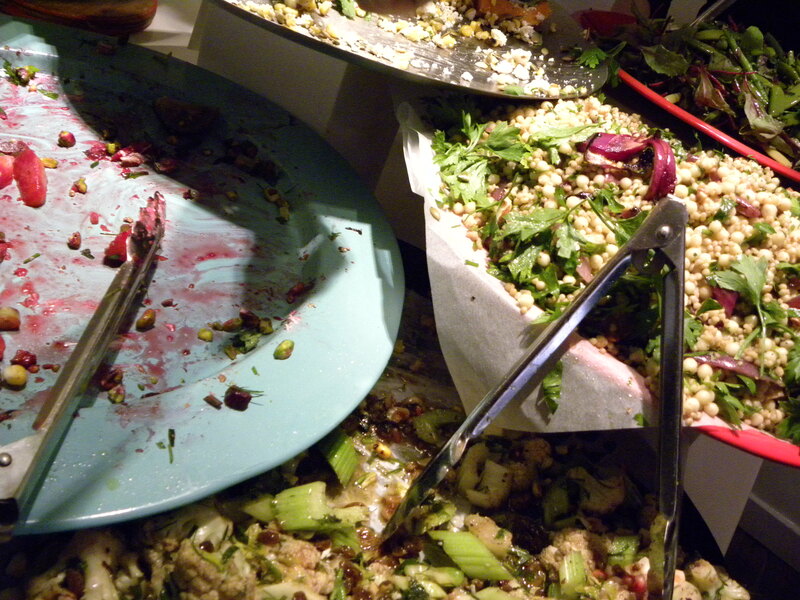 I have prepared a quick and easy, turned out fantastic sallad, from the cook book Plenty (2010), which I recommend. 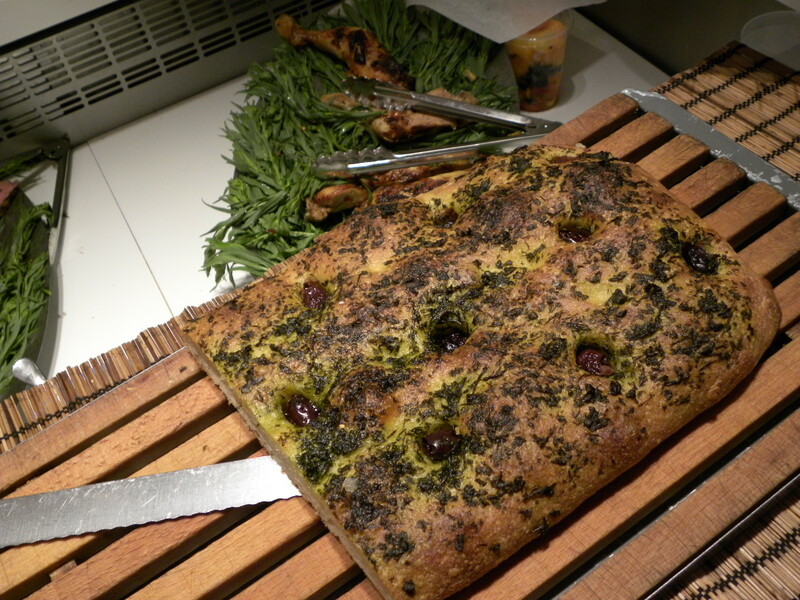 The recipes are based on the vegetarian column from the Guardian‘s Weekend magazine back in 2006. This particular dish I have chosen works wonders (even in dorm kitchens, yikes) both as a dish of its own and with for instance grilled chicken on the side. I bet it works great to mix it in the sallad as well. 250 g pasta, sunflower or corn oil, 3 courgettes, 1 ½ tbsp. red wine vinegar, 50 g basil(fresh), 15 g parsley (fresh), 75 g olive oil, 100 g small (frozen ok) soya beans, zest of 1 lemon, 200 g mozzarella cheese, small capers, salt and pepper. 3 courgettes, thicker slices – fry in oil (sunflower or corn) until golden, let drain, soak in 1 ½ tbsp. red wine vinegar. Cook (250 g) pasta al dente, rinse in cold water when done. put pasta, the courgettes, the green sauce, 100 g frozen small soya beans (edamame), grated zest of a lemon, 1 ½ tbsp small capers, basil leaves and 200 g mozzarella in chunky pieces, stir. Season with salt and pepper according to taste. Wish you all a great weekend and happy cooking! 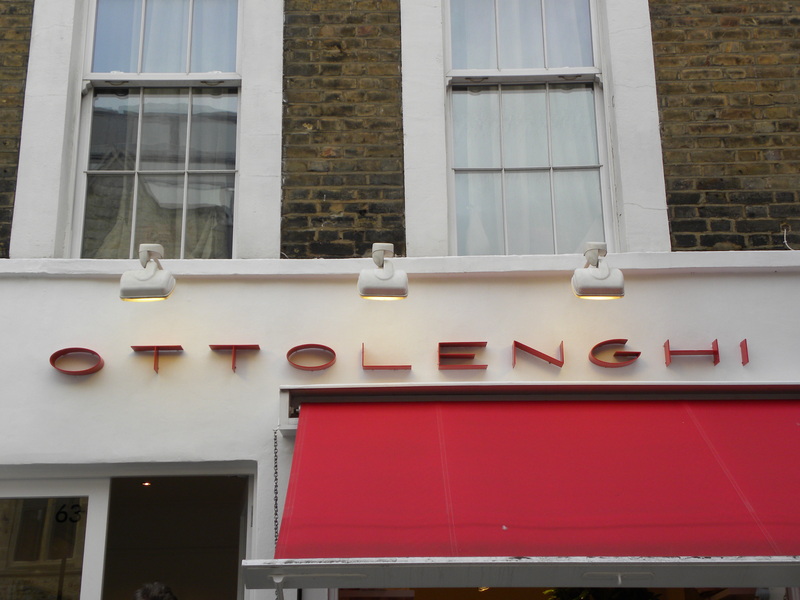 Ventured out and into the unknown today by stopping by Ottolenghi, a much raved about Notting Hill restaurant/take-out store. 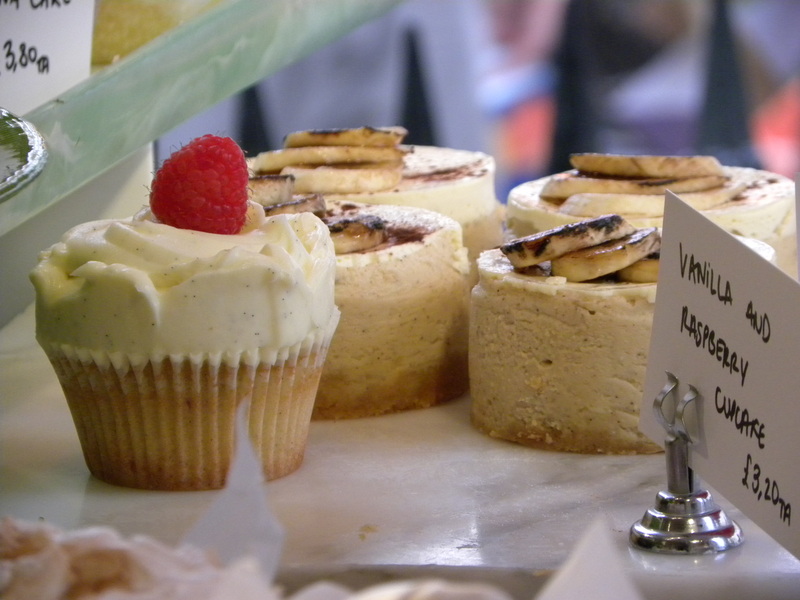 What the store lacked in size, it made up for with their large selection of succulent desserts and Mediterranean inspired food dishes. 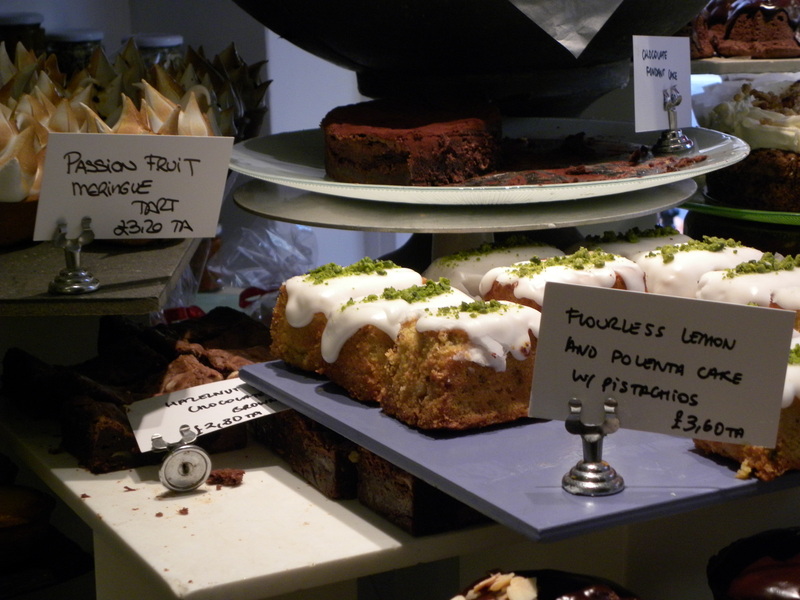 Clearly, I couldn’t leave empty handed without having tried at least one of their tasty treats. 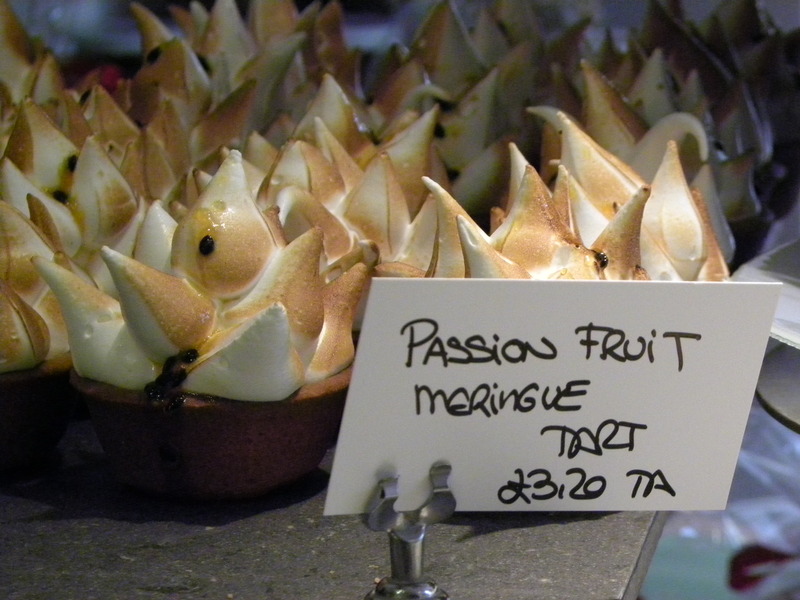 My choice, a passion fruit meringue tart that made my mouth melt! I absolutely have to return to try their food menu but on a less busy day! Yum!